One of the things I will always remember about my Camp Summit experiences is getting over my fear of snakes. Prior to 1994 I was scared stiff of snakes and wouldn’t go near them, snakes made me shiver and self-harm would have had more appeal to me than touching one. Camp Summit had a menagerie that was provided by one of the specialist members of staff – Harry, if I remember his name correctly (apologies if I don’t, it’s been a long time), travelled to camp with his car loaded with animals for the kids to interact with. Part of Harry’s travelling zoo included pythons – two to be exact, one albino and one in the standard colourway. I watched the youngsters engaging with these creatures and was amazed by their lack of fear. To be honest I felt like a bit of a wuss – being so frightened when children all around me weren’t. I resolved to conquer my fear and went to Harry for help. 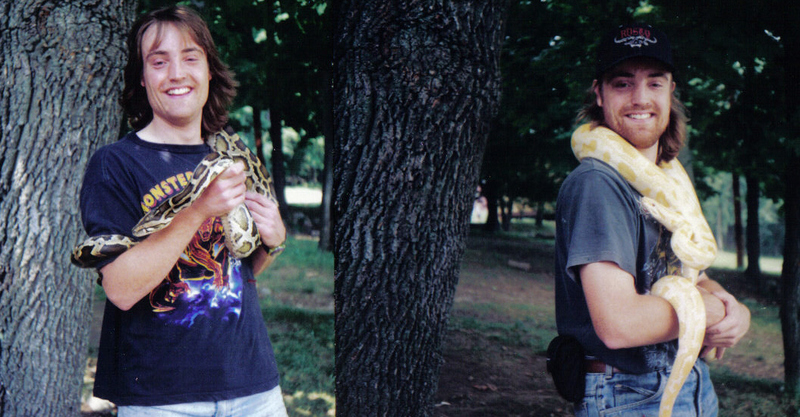 In due course, Harry got a snake out and placed it around my shoulder – I was prepared to be freaked out. I always thought that snakes were cold and slimy but the fact is that they aren’t – the python was muscular and dry and strong and, far from being horrible, was actually a pleasant creature to interact with. I stopped being scared and started being interested instead. Getting over a fear is a liberating experience and I am grateful that I was able to see off my snake phobia. My father-in-law runs a business called Animal Edutainment where he takes animals into different environments for children and adults to interact with them. He has snakes, lizards, big hairy spiders and all sorts of things that people might be nervous of (he does have more cuddly things too). Given his granddad has his own ‘zoo’, my lad has had snakes wrapped around him and didn’t worry at all – if I hadn’t had my phobia cured in America, I couldn’t have let him do it! It’s a fact that the fact that the Camp America programme helps children develop their skills and confidence, it is also a fact that it can help the adults learn more about themselves and develop as well!